Create your own Wonderful AllStars playlist on Spotify and get a chance to Win FREE tickets to the Wanderland Music Fest on May 17 at the Globe Circuit Grounds in Makati. Share you Playlist on Twitter with the Hashtag #WonderfulAllStars. Register to GLOBE GoSURF and enjoy FREE access to Spotify on your mobile phone. Join Now! 1. Create your own playlist for the Wonderful AllStars on Spotify. 2. 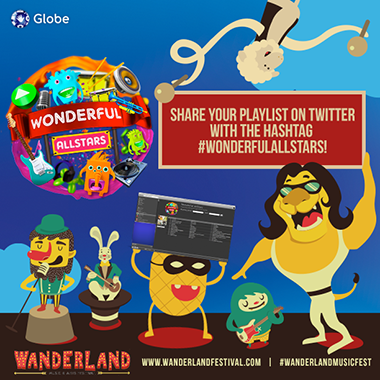 Share your playlist on Twitter with the hashtag: #WonderfulAllStars. 3. You may create many different versions of your playlist for more chances of winning. Visit Globe Telecom Facebook page for details and latest updates. You can also check our Facebook Page and Unlipromo Facebook Page for the latest feeds and more exciting offers.